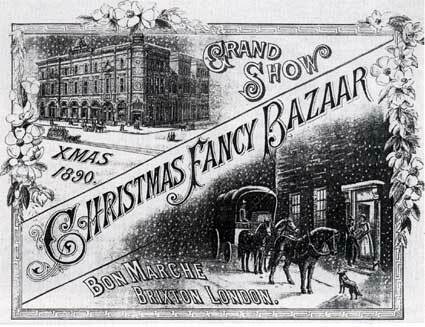 A festive handbill advertising a 'Grand Show' and a 'Fancy Bazaar' at the Bon Marché department store, Brixton Road. 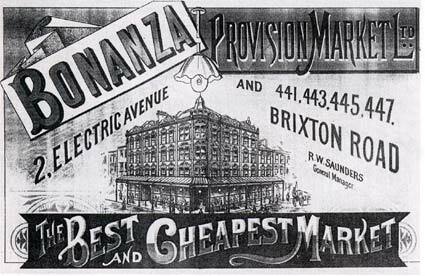 This impressive building on the corner of Brixton Road and Electric Avenue was later acquired by local grocery chain, Williamsons. Now stripped of its canopy, it is now owned by Iceland supermarket. 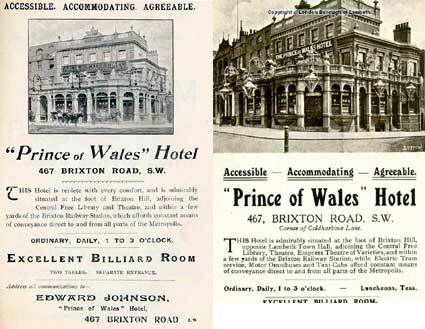 Two postcards bills from 1897 (left) and 1910 (right) advertising the 'Accessible, Accommodating and Agreeable' Prince of Wales Hotel on Coldharbour Lane. 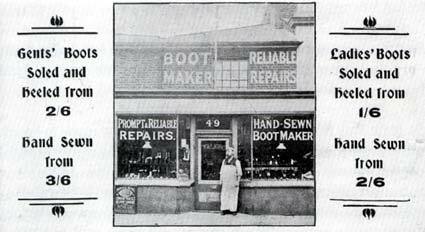 The hotel was billed as being 'replete with every comfort', 'admirably situated' and close to the Empress Theatre of Varieties, Brixton Railway station and an Electric Tram Service.